You can be young, passionate about Jesus Christ, surrounded by diversity, engaged in a postmodern world, reared in evangelicalism and not be an emergent Christian. In fact, I want to argue that it would be better if you weren't.The Emergent Church is a strong voice in today's Christian community. And they're talking about good things: caring for the poor, peace for all men, loving Jesus. They're doing church a new way, not content to fit the mold. Again, all good. But there's more to the movement than that. 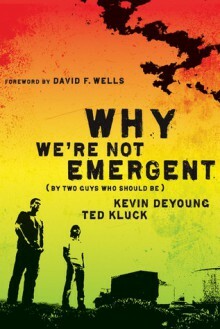 Much more.Kevin and Ted are two guys who, demographically, should be all over this movement. But they're not. And Why We're Not Emergent gives you the solid reasons why. From both a theological and an on-the-street perspective, Kevin and Ted diagnose the emerging church. They pull apart interviews, articles, books, and blogs, helping you see for yourself what it's all about.